Sen. Chris Murphy (D-Conn.) might be your new favorite senator, but unless you live or vote in Connecticut, he's not exactly your senator. On Wednesday, Murphy, along with several Democratic allies, vowed to speak about gun violence continuously on the Senate floor in an effort to get gun control on the voting agenda. Though Murphy led the charge, the Democratic senators who joined the filibuster kept the conversation going and the spirit of action alive. 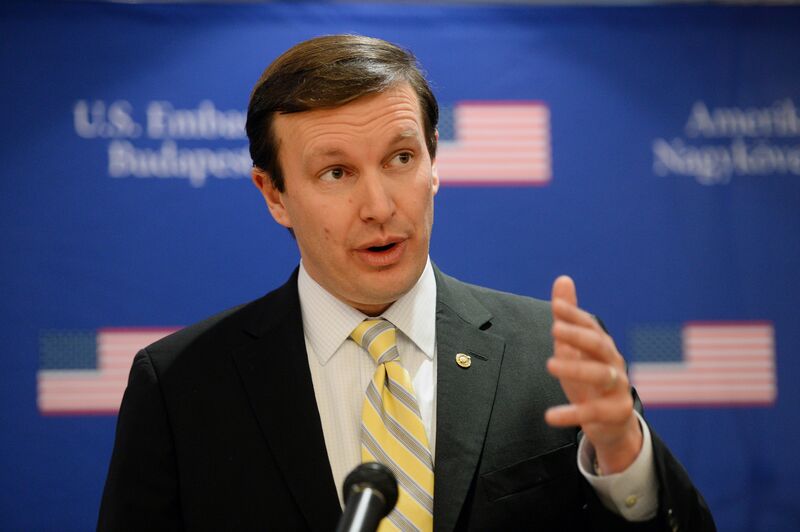 Murphy has made for a good face of the Democrats' gun control movement. He represents a state that is still dealing with the aftermath of the 2012 shooting at Sandy Hook Elementary School, and he has been one of the boldest advocates for congressional action on gun violence. In fact, after Sunday's massacre at a gay nightclub in Orlando, Murphy tweeted that Congress had become "complicit" in the murders caused by mass shootings thanks to its failure to act sooner on gun control. On Wednesday, Murphy tweeted a similar message, announcing his intent to filibuster the Senate floor: "I am prepared to stand on the Senate floor and talk about the need to prevent gun violence for as long as I can. I've had #Enough." Ten hours later, Murphy and his allies were still speaking. Blumenthal is Murphy's fellow Connecticut senator. Like Murphy, Blumenthal feels personally connected (and understandably so) to the state that suffered atrocities at the hands of a mass shooter in 2012. He even referenced Sandy Hook in his support of Wednesday's filibuster. A senator who some have called a rising star in Congress, Booker spoke particularly passionately during the filibuster on Wednesday. He read a list of many of the mass shootings that have happened in recent years, including those in Fort Hood in Texas, and Chattanooga, Tennessee. A senator from Maryland, Cardin also referenced Sandy Hook, as well as the mass shooting closer to his home state at Virginia Tech, in his support for gun control legislation. Cardin seemed particularly troubled by the weapon that was used in Sunday's shooting in Orlando, an AR-15, which is the civilian version of the military's M16. "I don't know too many people who need to have that type of weapon in order to do hunting in my state or to keep themselves safe," Cardin said on Wednesday. The Democratic whip, Durbin stood in solidarity with his Democratic allies in the Senate, but he also focused on another priority on Wednesday. Durbin spoke on the Senate floor about immigration reform, commemorating the fourth anniversary of an important immigration law signed by President Obama. Durbin played a large part in making the DREAM Act a reality for children of undocumented immigrants. Franken also spoke to the Senate about gun violence on Wednesday. Referencing the Orlando shooting, Franken said that Congress was failing the American people by staying inactive on gun laws. He also noted that he comes from a state where hunting is a treasured pastime, but he sees support for a new approach to gun laws from his constituents. Leahy is perhaps the lesser-known senator from Vermont, but he stood out in the Senate on Wednesday. Like many on his side, Leahy called for expanded background checks and restrictions on the type of guns that can be sold. A gun owner himself, Leahy said, "I think it's common sense that if we have assault weapons that are designed for the battlefield, they really have no place on our streets, in our schools, in our churches, or in our communities." Manchin stood with the other members of his party on Wednesday, but he went further than some of them did earlier in the day. In an appearance on Fox News on Wednesday morning, Manchin suggested that President Obama should use the term "radical Islam" to reference certain lone wolf terrorists. Markey focused on a particular sticking point of his: He called for Republicans to work with him and his fellow Democrats to prevent individuals on terrorist watch lists from buying a gun. Nelson hails from perhaps the most relevant state in Wednesday's filibuster: His home state of Florida is still picking up the pieces from the weekend's violence. The Sunday morning shooting at a gay nightclub in Orlando seems to have been the final straw for Nelson and the other Senate Democrats who supported the filibuster. Schumer made headlines in the fall of 2015 when he partnered with his cousin, comedienne Amy Schumer, to speak out against gun violence. That action was spurred by a shooting at a Louisiana movie theater during a screening of the actress's recent movie, Trainwreck. Warren showed her support for the filibuster by speaking to the Senate about her personal experiences at Boston pride events. "When I go, I don't march. I dance," she said on Tuesday. She focused heavily on the need to unite as Americans, rather than just the need for gun reform. The filibuster continued well into the night on Wednesday, and it seemed as if more and more legislators joined the cause as it went later. Aside from those who spoke to the Senate on Wednesday, many supportive members of Congress brought snacks and drinks to the speakers and spread the message of #Enough on social media.